Transportation Costs > How Much Does a Donut Tire Cost? How Much Does a Donut Tire Cost? A donut tire, also known as a spare tire to most, is meant to be a temporary replacement for a tire that has gone flat. 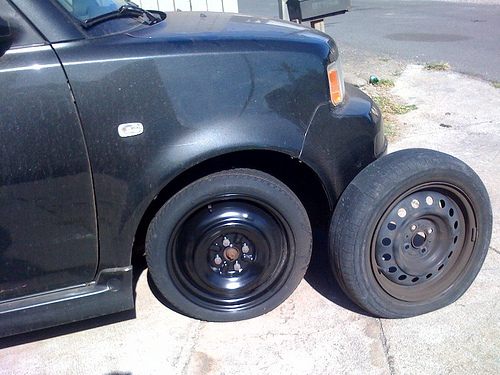 This spare tire can be the same as the original set of tires or can be a lower, generic version. These spare tires won’t have a tread and the body of the tire won’t be reinforced, preventing it from road imperfections. Usually, these tires can affect the car’s movement and driver’s ability to control the vehicle, and because of this, it is not recommended that you drive on a donut unless you absolutely have to. Basically, when you get a flat tire, you use the donut to get you as far as the nearest repair shop or to your home if you live close by and have a tire that can replace the flat one. How much does a donut spare tire cost? From our research, the cost of a donut tire will depend on the car you drive and where you purchase the tire. Most tires, regardless of the car you drive, can range anywhere from $40 to $200. A factory-based donut tire that resembles the cars currently on your car will cost as much as a new tire, whereas a third-party true donut tire can cost as little as $50 to $100. These are the prices for the tire only and won’t include the professional installation at a local tire shop. The estimates mentioned above will only include the tire and no professional installation. For instance, popular factory-based donut tires on Amazon retail for about $125 to $200. According to TireRack.com, the price and cost of the donut tire will depend on the type and the car model. Some cars have their own specific types of tires, even if they are just for replacements. On their website, most of the spare tires range anywhere from $70 to $200. You can purchase a donut spare tire at your local dealership, tire retailer or even online at large retailers such as TireRack.com. If you don’t mind purchasing used, your local junkyard may have a selection as well. Contrary to popular belief, a donut tire isn’t universal since it needs to match the bolt pattern on your car. The average donut tire, usually, will only last up to 70 miles. Again, remember this is a temporary solution and your car should be taken to a professional immediately to have it swapped. Check your car’s manual to see the restrictions on your car’s spare tire. As for distance, you should also drive slower as these tires are built to withstand faster speeds. Since they are more compact, it’s best to keep your speeds under 50 miles per hour. A donut tire is much smaller than a regular size tire, which means it is easier to fit in your trunk. Many newer cars have a place for the donut under the floor of the trunk so that it does not interfere with your storage space. If purchased online, shipping costs may apply due to the weight of the tire. When your donut tire is on, your electronic stability control and traction control systems may not work properly. Weigh your options of a donut tire or a real tire. A donut tire is smaller and easier to store, but it also means you have to buy a donut and also a replacement tire in the future. If you have the room in your car, you may be able to save yourself the money and hassle of having to change the tire twice. Aside from checking the local junkyard, other great places to find lower priced donut tires can include eBay and Craigslist. If purchasing used, pay close attention to the thread for any punctures or any sign of damage. It’s also best to make sure the tire is properly inflated before storing it.